As an expert in constitutional law, Sir Ivor Jennings played a pivotal role in the establishment of states emerging from British rule in the mid-20th century. He later became Master of Trinity Hall. As Smuts Visiting Fellow, Dr Harshan Kumarasingham is researching how Jennings and other British figures shaped the lives of millions of people around the world. Empires, even the greatest of them, wax and wane. As recently as the early 1920s, the British Empire covered an area that is almost inconceivable today. The inhabitants of its dominions, colonies and territories accounted for a fifth of the world’s population and its huge geographical spread was summed up by the chilling description ‘the empire on which the sun never sets’. However, just as the British Empire reached its peak, it was also crumbling as its composite parts pushed against their subordinate status. From the 1940s onwards, a growing number of countries which had been under British rule for as many as 200 years, embarked on the journey that led to their independence as members of the New Commonwealth – an affiliation to the British monarchy that for some nation states proved short-lived and for others more enduring. As Smuts Visiting Fellow in Commonwealth Studies for 2013-2014, the political historian Dr Harshan Kumarasingham is exploring the extraordinary role that Sir Ivor Jennings played at a pivotal period for newly-independent states across the world as they emerged from British rule. For many, it was an era of huge upheaval as, ill-prepared to deal with the task of state-building, they struggled to govern according to a foreign system often imposed with scant regard for regional and ethnic tensions. Jennings was a key figure in the process that saw the decolonisation of dozens of countries that made up the British Empire in the mid-20th century. Born in Bristol in 1903, he was educated at St Catharine’s College, Cambridge University, and towards the end of his career returned to the University to hold a number of prestigious posts. In his late 30s Jennings became the first vice chancellor of the newly-formed University of Ceylon in Sri Lanka (then Ceylon) and from 1942, right up until his death in 1965, acted as a specialist constitutional advisor to governments of developed and developing nations all over the world. Jennings’s career as a constitutional advisor had unique scope and breadth. It is possible that his relatively modest background and grammar school education, which would have been a barrier to entering the legal establishment in Britain, was a factor in his decision to look overseas to forge his career. Having made his name in Colombo, he worked with indigenous leaders to draw up the constitutions of countries as diverse in culture and geography as Canada and Ethiopia, Japan and Nepal, New Zealand and Malta. His legacy continues in some shape or form in the many parts of the world where elements of the Westminster-style constitutions he introduced live on. “The model Jennings favoured was the Westminster parliamentary system with its historic connection to the Crown and convention. The leaders with whom he collaborated to establish their own versions of Westminster represented the powerful elite of their countries and the systems they devised often didn’t take account of local and ethnic differences – such as regional languages and variations in ethnicity and education – which meant that certain groups were excluded from processes of self-government,” said Dr Kumarasingham. Dr Kumarasingham, who took up the Smuts Fellowship in October, is a New Zealander whose work to date has focused on the Westminster system and how it was exported across the world. He will be carrying out research in archives across the University of Cambridge and at the Public Records Office in London to develop a fuller and clearer picture of a process that affected millions of people in countries that had been colonised by the British. “Cambridge has remarkable resources for these papers including those of leading British Cabinet ministers,” he said. 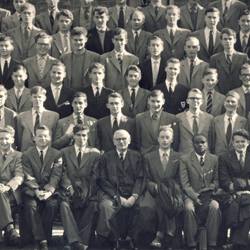 When Jennings returned to Britain in 1955, he became Master of Trinity Hall, Cambridge. He later served a term as Vice-Chancellor at the University of Cambridge, at a time when the position rotated among the heads of the Colleges. Jennings and his influence on overseas constitutions is just one strand of Dr Kumarasingham’s research, which looks more broadly at British decolonisation and state-building. Dr Kumarasingham, who is hosted by Professor Sir Christopher Bayly, Vere Harmsworth Professor of Imperial History Emeritus at the Centre for South Asian Studies, will also be looking at constitutional crises in the post-war Commonwealth and the influence of monarchy on democracy in South Asia.